The success of the Talbot 14/45 inevitably gave rise to a demand for more power and in 1929 Georges Roesch reworked his design to increase capacity and compression. The 2276cc unit still fitted the same chassis, but delivered 76bhp at 4500 rpm. At its heart was a fully counter -balanced seven-bearing crankshaft: the cooling was now pumped and pressurised with a conventional belt-driven fan; a single up-draught Zenith carburettor provided the fuel and a twin-point Delco-Remy distributor the sparks; hydraulic shock absorbers and central chassis lubrication improved comfort and convenience. The four speed “silent third” gearbox was superseded by Roesch’s modified Wilson pre-selector gearbox in 1933. Chassis were produced in 9’3”, 9’6” and 10’ variants. Open and closed bodies were provided by in-house coach-builder Darracq and a number of outside firms. The ambulance variant (also in 3 litre guise) was a mainstay of the London County Council right through the war. 1935 saw substantial revisions with a new dropped chassis, advanced traffic-clutch transmission and bang up- to-date “airline” body styling. The final years of production saw the BD75 model adopt the Rootes centre-change synchromesh gearbox, conventional clutch and separate starter motor and dynamo. The Talbot 90 was a tuned version encouraged by London dealers Fox and Nicholl for sports car racing. With a 10:1 compression ratio and downdraft Zenith carburettor it developed 93bhp and sporting a lightweight four-seater body on the 9’3” chassis it did exceptionally well – claiming 3rd overall at Le Mans in 1930 and winning the Index of Performance handsomely. It delivered many class wins in domestic racing at Brooklands and Ireland. Road going versions were offered with a 7:1 compression ratio and variety of sporting bodies; early cars used the ‘spur’ gearbox, followed by the ‘Silent Third’ and latterly the Wilson pre-selector. They all delivered sparkling performance and were said to be Georges Roesch’s favourite model. 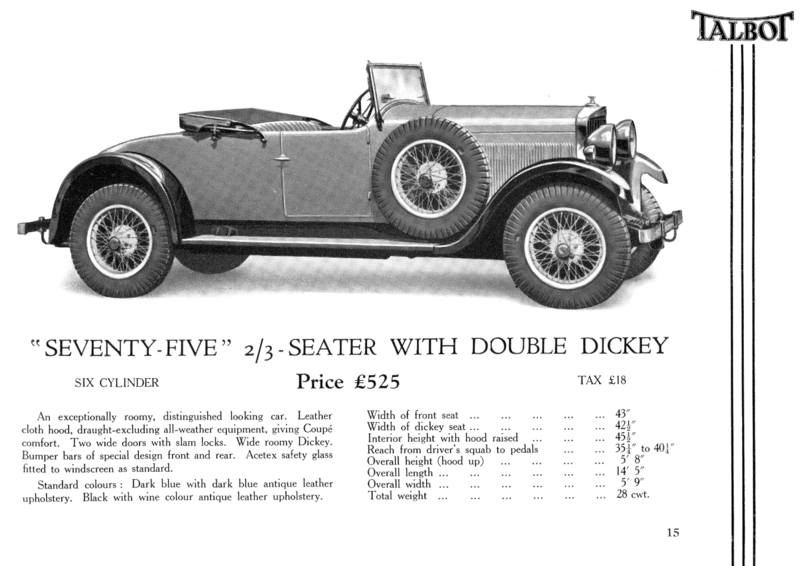 The 18hp cars were the mainstay of Talbot production in the mid 1930s and provided the platform for the more glamorous larger-engined cars that were to come. They offered high quality, high performance motoring at a modest price and were the very last Roesch Talbot cars to leave Barlby Road in late 1937. About 120 survive and with a top speed of 75mph they are highly usable on today’s roads.